Atherosclerosis is a diffuse, degenerative disease of the arteries that results in the formation of plaques composed of necrotic cells, lipids, and cholesterol crystals. These plaques can cause stenosis (see the image below), embolization, and thrombosis. Atherosclerosis has a predilection for certain arteries, including the extracranial carotid artery. Note: The percentage of stenosis used as the threshold for CEA varies among available literature. Generally, symptomatic patients with greater than 50% stenosis and healthy, asymptomatic patients with greater than 60% stenosis warrant consideration for CEA. Treatment of atherosclerosis of the carotid artery is dependent on the severity and degree of the disease. Atherosclerosis is a degenerative disease of the arteries that results in the formation of plaques composed of necrotic cells, lipids, and cholesterol crystals (see the images below). These plaques can result in symptoms by causing stenosis, by embolizing, or by thrombosing. Atherosclerosis is a diffuse process with a predilection for certain arteries. This article describes the history and impact of this process as it occurs in the extracranial carotid artery. Atherosclerotic plaque removed at time of carotid endarterectomy (areas of ulceration with thrombus and intraplaque hemorrhage are present). For patient education resources, see the Brain and Nervous System Center and the Cholesterol Center, as well as Stroke, High Cholesterol, Understanding Your Cholesterol level, and Lifestyle Cholesterol Management. The carotid artery originates from the innominate artery on the right and directly from the aortic arch on the left. The carotid artery enlarges in the midneck, forming the carotid bulb, before bifurcating into the external and internal carotid arteries. The carotid sinus and carotid body are located at the bifurcation (see the image below). Arteriogram of aortic arch and its branches. Currently, embolization is considered the most common mechanism causing ischemic strokes from atherosclerotic lesions in the carotid bulb. Thrombosis and low flow are other possible mechanisms. Stroke is one of the most devastating complications of carotid stenosis. 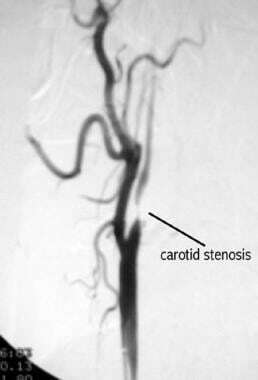 However, carotid stenosis is not the only cause of stroke. In fact, among patients with asymptomatic stenosis of 60-99%, as many as 45% of strokes may be caused by lacunar infarcts or cardiac emboli. Cranial nerve injuries occur in 2-7% of patients. Recurrent laryngeal and hypoglossal nerve dysfunctions are the most common. Postoperative stroke occurs in 1-5% of patients. The perioperative mortality is 0.5-1.8%. Recurrent stenosis develops in 1-20% of cases, and reoperation is necessary in 1-3% of cases. In the North American Symptomatic Carotid Endarterectomy Trial (NASCET), the 2-year stroke risk after a successful carotid endarterectomy (CEA) was 1.6%, compared with 12.2% for the medically managed patients. The cumulative risk of an ipsilateral stroke was 9% for the surgical patients and 26% for the medically managed patients. In the Asymptomatic Carotid Atherosclerosis Study (ACAS), the 5-year risk for ipsilateral stroke was 5.1% for the surgical group and 11% for the medical group. The stroke risk of arteriography was attributed to the surgical group and was 1.2%. A meta-analysis revealed that protected (use of an embolic protection wire) CAS was associated with an 8.2% rate of stroke or death at 30 days, compared with 6.2% for surgery  ; however, the rates of disabling stroke or death within this period were not significantly different between the two groups. Meier et al conducted a systematic review and meta-analysis of 11 randomized controlled clinical trials to evaluate the relative short-term safety and intermediate-term efficacy of CEA versus CAS. CEA carried a lower risk of periprocedural mortality or stroke than CAS did, mainly because of a decreased risk of stroke. However, the risk of death and the composite endpoint of mortality or disabling stroke did not differ significantly between the two procedures. In addition, the odds of periprocedural myocardial infarction (MI) or cranial nerve injury (CNI) were higher among the CEA group as compared with the CAS group. In the intermediate term, the risk of stroke or death did not differ significantly between the two. A study by Illuminati et al suggested that with regard to the timing of CEA, previous or simultaneous CEA in patients with unilateral severe asymptomatic carotid stenosis (>70%) undergoing coronary artery bypass grafting (CABG) was better able to prevent stroke than delayed CEA was. The overall surgical risk was not increased. Brott et al carried out a pooled analysis of individual patient data (N = 4754) from the EVA-3S, SPACE (Stent-Protected Percutaneous Angioplasty of the Carotid Artery versus Endarterectomy), ICSS (International Carotid Stenting Study), and CREST trials to compare long-term outcomes of CEA and CAS for treatment of symptomatic carotid stenosis. Patients were followed for a maximum of 12.4 years (median follow-up, 2.0-6.9 years). The primary outcome was the composite risk of stroke or death within 120 days after randomization (periprocedural risk) or subsequent ipsilateral stroke up to 10 years after randomization (postprocedural risk). In patients who underwent CEA, 129 periprocedural and 55 postprocedural outcome events occurred, compared with 206 periprocedural and 57 postprocedural outcome events in those who underwent CAS. After the periprocedural period, annual rates of ipsilateral stroke per person-year were 0.60% for CEA and 0.64% for CAS. Overall, the combined periprocedural and postprocedural risks favored CEA; treatment differences at 1, 3, 5, 7, and 9 years ranged from 2.8% to 4.1%. However, the similarity in postprocedural rates suggested that improvements in the periprocedural safety of CAS could yield outcomes similar to those of CEA in the future. Stroke facts. Centers for Disease Control and Prevention. Available at https://www.cdc.gov/stroke/facts.htm. September 6, 2017; Accessed: February 21, 2019. Young B, Moore WS, Robertson JT, Toole JF, Ernst CB, Cohen SN, et al. An analysis of perioperative surgical mortality and morbidity in the asymptomatic carotid atherosclerosis study. ACAS Investigators. Asymptomatic Carotid Atherosclerosis Study. Stroke. 1996 Dec. 27 (12):2216-24. [Medline]. Mas JL, Trinquart L, Leys D, Albucher JF, Rousseau H, Viguier A, et al. Endarterectomy Versus Angioplasty in Patients with Symptomatic Severe Carotid Stenosis (EVA-3S) trial: results up to 4 years from a randomised, multicentre trial. Lancet Neurol. 2008 Oct. 7 (10):885-92. [Medline]. Wiesmann M, Schöpf V, Jansen O, Brückmann H. Stent-protected angioplasty versus carotid endarterectomy in patients with carotid artery stenosis: meta-analysis of randomized trial data. Eur Radiol. 2008 Dec. 18 (12):2956-66. [Medline]. Meier P, Knapp G, Tamhane U, Chaturvedi S, Gurm HS. Short term and intermediate term comparison of endarterectomy versus stenting for carotid artery stenosis: systematic review and meta-analysis of randomised controlled clinical trials. BMJ. 2010 Feb 12. 340:c467. [Medline]. [Full Text]. Gurm HS, Yadav JS, Fayad P, Katzen BT, Mishkel GJ, Bajwa TK, et al. Long-term results of carotid stenting versus endarterectomy in high-risk patients. N Engl J Med. 2008 Apr 10. 358 (15):1572-9. [Medline]. [Full Text]. Illuminati G, Ricco JB, Caliò F, Pacilè MA, Miraldi F, Frati G, et al. Short-term results of a randomized trial examining timing of carotid endarterectomy in patients with severe asymptomatic unilateral carotid stenosis undergoing coronary artery bypass grafting. J Vasc Surg. 2011 Oct. 54 (4):993-9; discussion 998-9. [Medline]. Brown K, Itum DS, Preiss J, Duwayri Y, Veeraswamy RK, Salam A, et al. Carotid artery stenting has increased risk of external carotid artery occlusion compared with carotid endarterectomy. J Vasc Surg. 2015 Jan. 61 (1):119-24. [Medline]. Brott TG, Hobson RW 2nd, Howard G, Roubin GS, Clark WM, Brooks W, et al. Stenting versus endarterectomy for treatment of carotid-artery stenosis. N Engl J Med. 2010 Jul 1. 363 (1):11-23. [Medline]. [Full Text]. Hill MD, Brooks W, Mackey A, Clark WM, Meschia JF, Morrish WF, et al. Stroke after carotid stenting and endarterectomy in the Carotid Revascularization Endarterectomy versus Stenting Trial (CREST). Circulation. 2012 Dec 18. 126 (25):3054-61. [Medline]. Brott TG, Calvet D, Howard G, Gregson J, Algra A, Becquemin JP, et al. Long-term outcomes of stenting and endarterectomy for symptomatic carotid stenosis: a preplanned pooled analysis of individual patient data. Lancet Neurol. 2019 Feb 6. [Medline]. van Engelen A, Wannarong T, Parraga G, Niessen WJ, Fenster A, Spence JD, et al. Three-dimensional carotid ultrasound plaque texture predicts vascular events. Stroke. 2014 Sep. 45 (9):2695-701. [Medline]. Canadian Cooperative Study Group. A randomized trial of aspirin and sulfinpyrazone in threatened stroke. N Engl J Med. 1978 Jul 13. 299 (2):53-9. [Medline]. Kato T, Sakai H, Takagi T, Nishimura Y. Cilostazol prevents progression of asymptomatic carotid artery stenosis in patients with contralateral carotid artery stenting. AJNR Am J Neuroradiol. 2012 Aug. 33 (7):1262-6. [Medline]. Orrapin S, Rerkasem K. Carotid endarterectomy for symptomatic carotid stenosis. Cochrane Database Syst Rev. 2017 Jun 7. 6:CD001081. [Medline]. Halliday A, Mansfield A, Marro J, Peto C, Peto R, Potter J, et al. Prevention of disabling and fatal strokes by successful carotid endarterectomy in patients without recent neurological symptoms: randomised controlled trial. Lancet. 2004 May 8. 363 (9420):1491-502. [Medline]. National coverage determination (NCD) for percutaneous transluminal angioplasty (PTA) (20.7). Centers for Medicare and Medicaid Services. Available at https://www.cms.gov/medicare-coverage-database/details/ncd-details.aspx?ncdid=201. March 11, 2013; Accessed: February 21, 2019. Moore WS, Popma JJ, Roubin GS, Voeks JH, Cutlip DE, Jones M, et al. Carotid angiographic characteristics in the CREST trial were major contributors to periprocedural stroke and death differences between carotid artery stenting and carotid endarterectomy. J Vasc Surg. 2016 Apr. 63 (4):851-858.e1. [Medline]. Lal BK, Beach KW, Roubin GS, Lutsep HL, Moore WS, Malas MB, et al. Restenosis after carotid artery stenting and endarterectomy: a secondary analysis of CREST, a randomised controlled trial. Lancet Neurol. 2012 Sep. 11 (9):755-63. [Medline]. Carotid artery exposed prior to carotid endarterectomy (coil present in internal carotid artery). 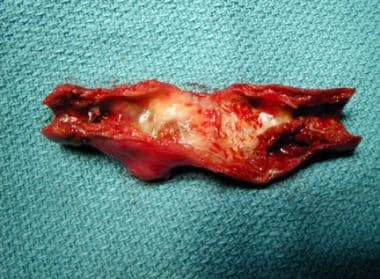 Carotid artery following endarterectomy and prior to closure (tapered endpoint and smooth appearance of lumen). Carotid artery following Dacron patch angioplasty. Oblique view of left carotid artery demonstrating lesion within internal carotid artery. 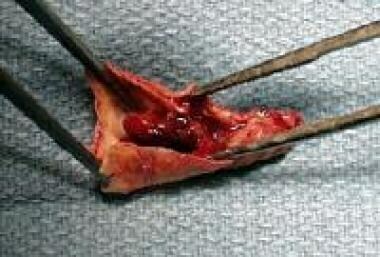 Placement of stent into internal carotid artery. Note filter wire in upper photos (dots at top of internal carotid artery). Angioplasty after stent placement; again, note filter wire protecting distal carotid artery. 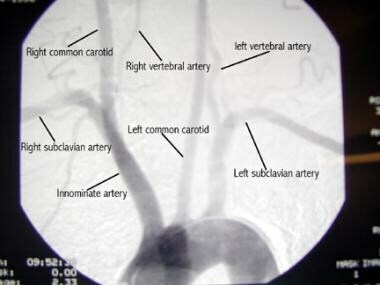 Completion arteriogram displaying improvement in diameter of internal carotid artery. Normal carotid arteries on color flow duplex ultrasonography. Color flow duplex ultrasonogram reveals 80-99% left carotid stenosis and normal right carotid.